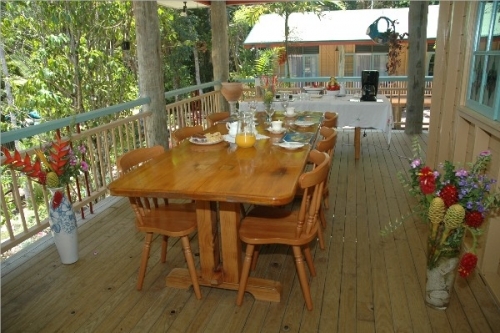 The Lodge is an award winning Queenslander pole home, set in World Heritage rainforest just one and a half kms from the beach. 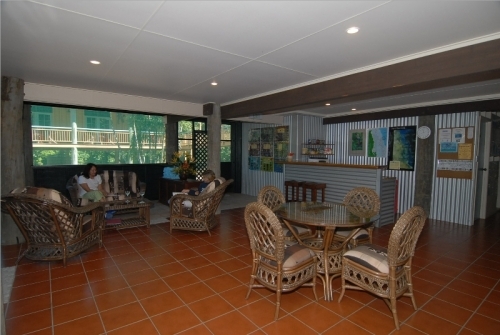 Guest accommodation, which is separate to the main house, is fully ensuite. 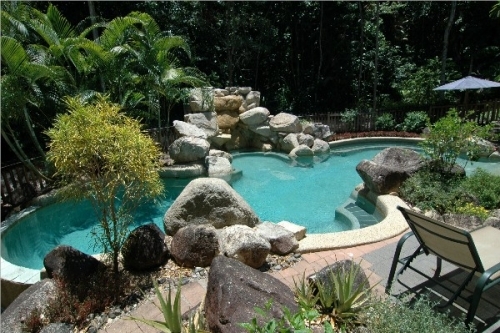 We have a great swimming pool with a waterfall feature - it has just got to be the best in the area. The colourful grounds have a tropical feel to them - lots of native plants to attract scores of birds and butterflies, including the Ulysses. If you fancy a few cuttings from the garden just ask Mick (the head gardener, waiter, repair man etc..) - he will gladly oblige. There is a large guest lounge - complete with TV, DVD, book swap library, games (Trivial Pursuit, chess, backgammon etc..). We have lots of DVDs, including the full set of Fawlty Towers and Yes Minister episodes. We have several resident cassowaries that visit the Lodge each day - so if you have not seen this magnificent and endangered bird in the wild - this is your big chance. Mission Beach is blessed with several excellent restaurants which are all close by. If you are a bit tired of eating out then we have cooking facilities and a BBQ at your disposal. Extreme sports are available here - white water rafting and Sky Diving - but most of all you will be knocked over by the tranquility and serenity of Mission Beach. So what else do you get for your money ?? Well, we serve the yummiest brekky on offer in all Queensland (probably !!). And how good is this folks - we offer complimentary drinks - tea, coffee, soft drinks and BEER. Wow !! what a bargain. If you really insist, you can have a go on our ride-on mower - about two hours should do the trick. Laundry facilities are here, iron and ironing board (surely not on holiday ??) and of course Wireless Internet access. It's all here at Licuala Lodge - why stay anywhere else ?? Please note that the Lodge is NOT suitable for children under the age of ten.